Alleppey in Kerala is the place where nature has spent her richest bounties.These words of Lord Curzon deservingly describe this beautiful city of Alappuzha District. Many eminent personalities have from time to time confirmed the city’s title as the ‘Venice of the East’. Canals and lagoons form the exciting features of the city and make it a unique tourist destination with great allure. Bounded by the Arabian Sea on the western side, the city is also admired for its beaches. However, the backwaters and houseboats in Alleppey are the most distinguished features that attract hundreds of thousands of tourists every year. Alleppey Beach has been the site for the filming of many popular movie scenes. The beach offers the marvelous views of the Arabian Sea and offers the old world charm through its landmark lighthouse and remains of the old sea bridge. Located on the beach are many milestone attractions, Ambalappuzha Sri Krishna Temple being one of them. Built way back in the 8th century, the temple has a mystic charm which is enough to spellbind the visitors. St. George Catholic Church and St. Mary’s Forane Church are other nearby attractions that can be viewed from the beachfront. The beach is clean and lets the tourists spend some great moments enjoying the sunset and sunrise views. Another beach in Alleppey is Marari Beach which accommodated worthwhile attractions like Mahadeva Temple and Athunkal Church. The limitless network of freshwater rivers, lagoons and makes feed the city and enhances its beauty of manifold.Another constituent of the vast natural beauty of the region is the miles of wetland area. Wetlands in the region welcome a number of migratory species like cormorants and ducks which add to the charm of exploring the place.The tourists visiting the city are enthralled by the boundless beauty of the paddy fields. There are some other attractions like Pandavan Rock that offers excellent opportunities for rock climbing.Krishnapuram Palace is another tourist spot and is known for showcasing astonishing Kerala architectural style.Many beautiful mural paintings and sculptures are exhibited at this palace. The annual snake boat race organized in the city is another reason for the tourists to plan their holidays in Alleppey. The enticing scene of beautifully decorated boats competing on the Punnamada Lake for the prestigious Nehru Trophy is worth watching. If you are planning to visit Alleppey,there is no reason to miss staying at one of the traditional houseboats.These boats surprisingly have all modern amenities available for the guests. Another attractive aspect of these unique accommodations is that the guests are served with delicious foods cooked onboard. 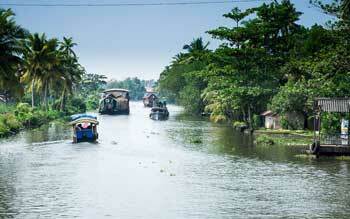 It is the lifetime opportunity to sail through the serene backwaters in Alleppey using a houseboat. The tourists can enjoy the treasures of natural beauty that they come across during these boat rides.It is indeed relaxing to watch the simple lifestyle of the local villagers engaged in different types of activities. 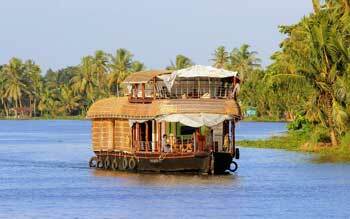 Honeymoon couples and family travelers love to enjoy memorable houseboat tour packages while on a trip to Alleppey. The religious tourists and pilgrims can visit the city during the grand celebrations of temple festivals. 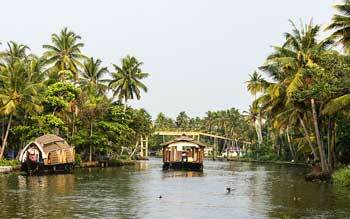 Alleppey is also known for a number of traditional activities like coir manufacturing and bamboo furniture making. The tourists can take a trip around the city to witness these wonderful activities.Another popular attraction of the region is the Ayurveda treatment centers. These centers and spas make use of natural therapies and herbs to alleviate a number of ailments. A relaxing massage at one of these venues is enough to soothe the mind and the body.